GTI-Net lost its appeal against an investment fraud warning issued by Belgium’s Financial Services and Markets Authority (FSMA). The company responded by “shutting down”, only to reboot itself with a new name and website. The FSMA issued its warning in November 2017.
had a business model that “clearly resembles that of a pyramid scheme, or at the very least, a Ponzi fraud”. In an attempt to legitimize its activity, GTI-Net took the FSMA to court. In December 2018, Tribunal of First Instance in Brussels upheld the FSMA warning. 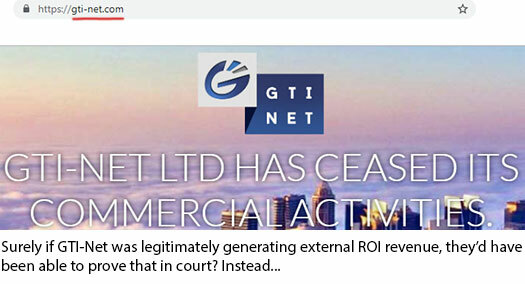 The ruling was significant for GTI-Net, as even today the majority of traffic to its website originates from Belgium. In light of the failed appeal, GTI-Net owner Jhony Depresseux (right) should have shut the company down. Or better yet Belgian authorities should have shut it down and pressed charges. Instead, in light of the FSMA publicizing the failed appeal in February 2019, GTI-Net shut down its website. Did GTI-Net really cease its commercial activities though? Hardly. GTI-Net has now rebooted itself as “Global Technology Innovation”. The company operates out of a new domain (“globaltechnologyinnovation.ae”), which is registered to Paul Louis Hofmans. On his personal Twitter profile Hofmans cites his location as Dubai. On the professional side of things Hofmans runs N.E.R. Management Consultancies. As per their website, N.E.R. Management Consultancies assists companies with “setting up” in Dubai. To this end a PO Box corporate address for “Global Technology & Innovation LLC” is provided on their website. Reading between the lines, all Jhony Depresseux has done is pay a third-party to create a shell company in Dubai. There’s no new company here… it’s the same GTI-Net scam being run out of Belgium. Depresseux traveled to Dubai to set the reboot up in late January. He’s assumed to have returned back to Spa, Belgium, where he otherwise resides. As of now the Global Technology Innovation website is barebones. GTI-Net affiliates can sign in to a backoffice and that’s about it. To hear Depresseux tell it though, the new GTI-Net Ponzi scheme will be nothing short of revolutionary. This is a physical product of a new technology. This product today doesn’t exist yet. And yet, we can tell you that it will interest 100 % of the people in the world. It’s amazing, it’s amazing. Imagine that a company has had the global priority of internet connections. That you could have been a part of this society? Well, what we’re going to offer you is even stronger than this. It is a real technological revolution that will certainly change the face of the world and it is a technology that will be distributed by GTI-net. When you have seen this product, you will understand that gti-net is a company whose future is assured for hundreds of years. This technology represents more than 100 years of research. Indeed, it is already in 1901 that we see the first research on this type of technology. And today more than 100 years later, all this can be in your hands. This product will create hundreds of thousands of jobs around the world, in addition to yours as a GTI-net member. There are billions of products to distribute around the world. One former GTI-Net victim claims Global Technology Innovation plans to flog €1200 EUR crypto mining rigs. For the record, GTI-Net’s original Ponzi scheme ruse was forex trading (no evidence of which was ever provided). Whether Belgium takes a proactive approach to Depresseux’s new Ponzi scheme remains to be seen. Pending release of an actual business model, we’ll of course be publishing our own Global Technology Innovation review. No suprise, once a scam always a scam. A few people enriching themselves out of the pockets of many others every month with their guaranteed income claim. The whole scam success of GTI is based on the data base of PlanB4You from mr johny Schabregs. Johny is a convicted scammer and a fugitive from the Dutch law system. Alexa rankings show that this early new start under another name generates traffic from Russia, so they might have found a new territory to scam people on.